Just a little outfit post of my usual work attire, pretty conservative but I try to jazz it up with accessories - cue huge rings, pretty headbands or bulky necklaces. I wish we didn’t have a dress code at work sometimes I just want to wear jeans and a jumper. 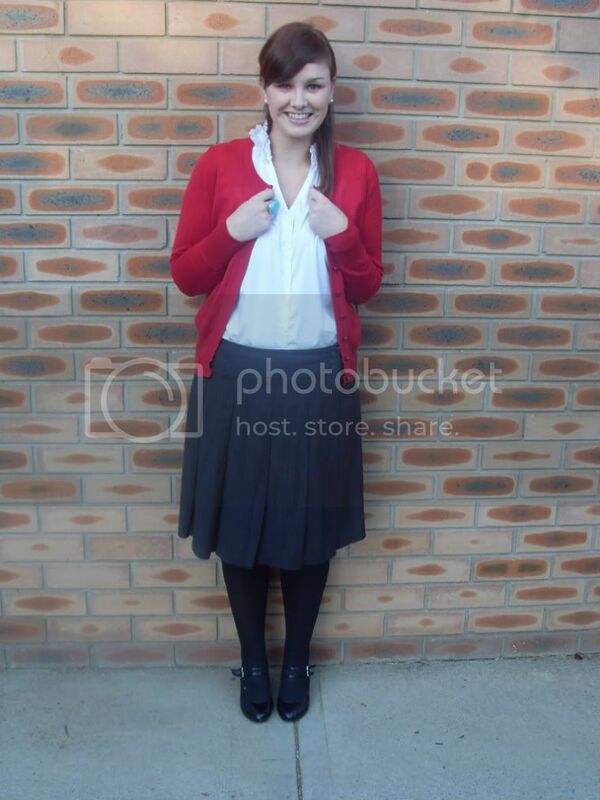 This skirt reminds me of a similar one my Nan would wear when she would take me to church when I was little. My Nan would sing so loudly in church that I use try and hide behind the pews, it seems like such a silly thing to have done now, but the skirt is a nice little reminder of her when I wear it. Thank goodness tomorrow is Friday and then were back to the weekend. Work has been good this week but it is so exhausting, like everyone by the end of the week you are just ready to relax.I got to work today and my lunch had spilt all through my gym bag and I had to go to the gym covered in avocado, I am not sure if anyone noticed or they were just too polite to say anything. It was a beautiful Autumn day today and I got to eat my lunch in the park, winter isn’t too far away and I am dreading being stuck indoors. Is blogger misbehaving for you? It hasnt been letting me comment on other peoples blogs, very frustrating, hopefully it will all be sorted soon. P.S I guest posted on the wonderful Meghan's blog, The Perfect Compilation Tape, if you have time I would love you to visit. i LOVE your red cardigan!! it looks so great on you! i am thinking i need one too!! 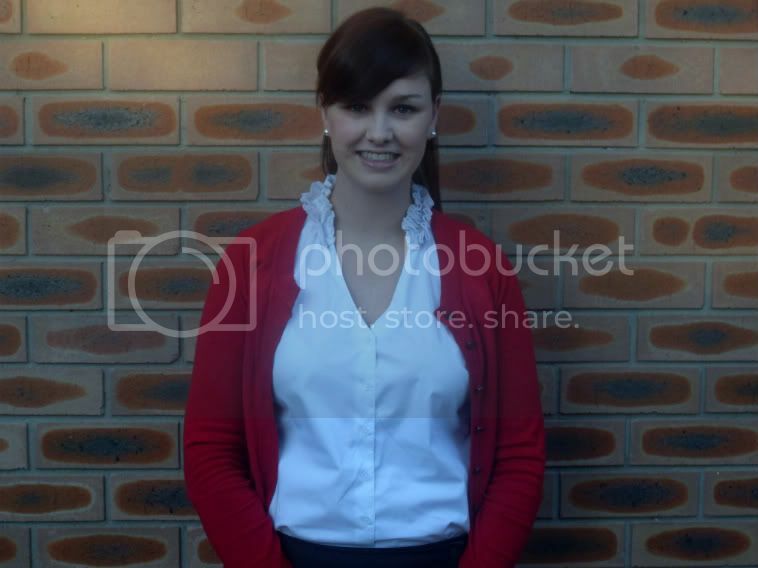 Love this work outfit! Your ring is beautiful! 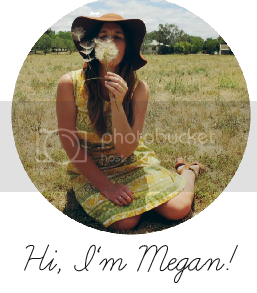 I'm a visitor from Meghan's blog and your newest follower! Your list of fun things to do in the US is awesome!! I lived in San Francisco for a summer and you will LOVE that City! Alcatraz is a must! Also ride the cable cars--so fun! And go walk around North Beach, totally my favorite neighborhood! Washington Square Park--you'll love it. You look beautiful. 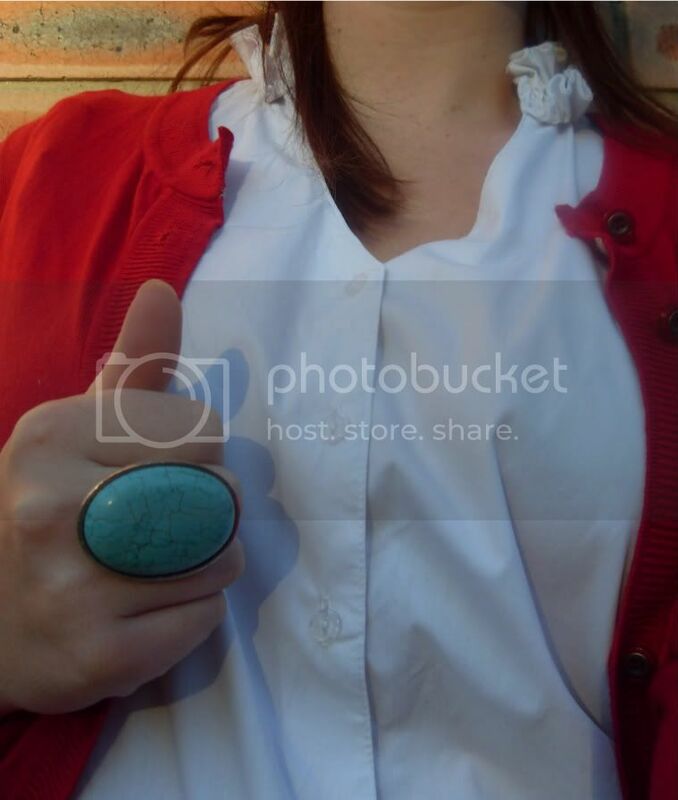 :) The turquoise ring is perfect. I'm heading to Meghan's blog now to read your guest post. xoxo. At least you are wearing a pop of colour. 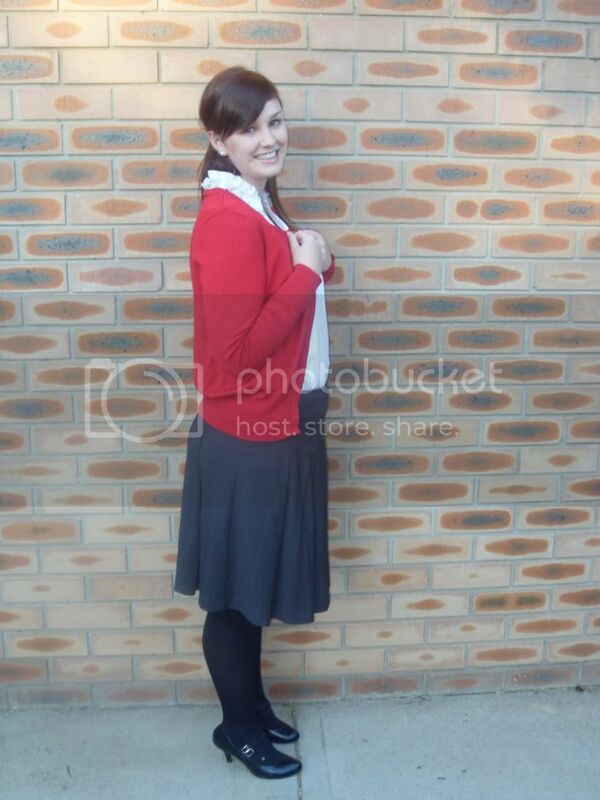 The red cardi is so lovely. I have one too and I adore it. Adding accessories is always good when you have a dress code :) You look gorgeous. I love your ring! So awesome! thanks so much for the comment on my blog i loved hearing your confetti story- come back again soon! Thank you for your comment!! Are you getting a bloglift from Designer Blogs too? I know I wish I could understand HTML codes a little better... you can do some seriously fun things! You have a cute blog!! I am glad to have met you. PS I love your tea cups I have a thing for tea. I had tea cups as the center pieces for my wedding. I LOVE THEM!!!! Love your outfit! It's simple, but fabulous! It's a cute work outfit. The red cardi makes it nice and bright. Hope you have a relaxing weekend.